It starts with a shipwreck following a magical storm at sea. Horace, a soldier from the west, had joined the Great Crusade against the heathens of Akeshia after the deaths of his wife and son from plague. When he washes ashore, he finds himself at the mercy of the very people he was sent to kill, who speak a language and have a culture and customs he doesn’t even begin to understand. Not long after, Horace is pressed into service as a house slave. But this doesn’t last. The Akeshians discover that Horace was a latent sorcerer, and he is catapulted from the chains of a slave to the halls of power in the queen’s court. Together with Jirom, an ex-mercenary and gladiator, and Alyra, a spy in the court, he will seek a path to free himself and the empire’s caste of slaves from a system where every man and woman must pay the price of blood or iron. Before the end, Horace will have paid dearly in both. 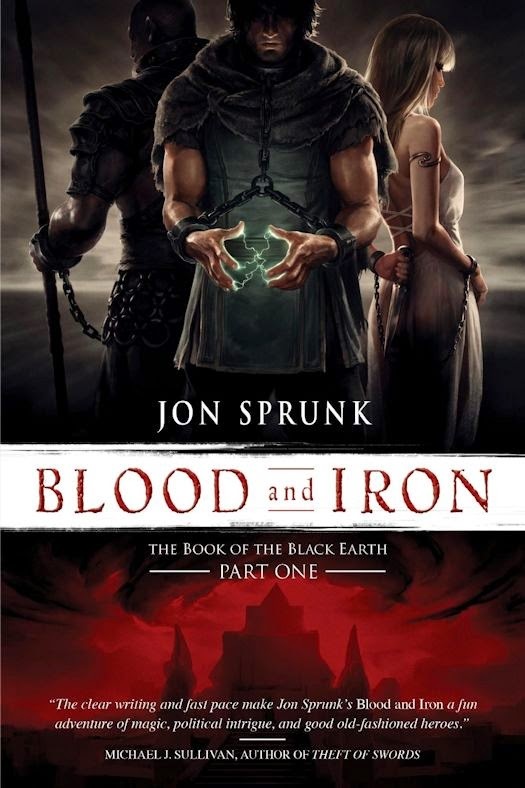 Blood and Iron is the first book in a gritty fantasy series by Jon Sprunk. The majority of the story takes place in a North African-like setting, with plenty of desert scenery. The Akeshian Empire has hints of Egyptian and Babylonian cultural influences. The back cover states that Horace is a crusader, which is only partially correct, he's a shipwright trying to overcome a tragic past by using his skills as a carpenter for the boat that is transporting crusaders. He's not a trained fighter. I feel it's important to clear that up as it misleads potential readers. Horace, Jirom and Alyra are all great characters. You immediately feel they are real and want to see them survive the book. Alyra is a great female character, she's fully fleshed out. The last thing I'll say about characters is that Byleth the Queen is a great secondary character. Even after reading the book, I'm not sure how I feel about her, because she was so well written. She had moments that made me feel she was a good person stuck in a bad situation and other times I felt she was down right evil. I've always liked Sprunk's characters and find them to be one of his strengths as an author. Sprunk is also great at writing a story with a great pace. There's plenty of action as well as moments of reflection for each of the characters and side characters so the reader can become fully immersed in the story. The plot of the story takes a natural approach to its progression with a few surprises I enjoyed. I loved the way Sprunk developed Horace's latent magical abilities. It's refreshing to see someone not master their skills quickly. He struggles and fails enough to make it realistic. Even at the end of the story, there is plenty of room for Horace to grow in the next book. The magical system is also a great setup. I've seen a few like it before, but Sprunk puts his own twist on it that I really enjoyed. There are only two areas I felt could have improved the book. First, there is an unusual love triangle in the story that for me didn't feel natural. I'll explain. After each of the characters meet each other, the reader is told that one person loves the other and vice versa between the three of them, but there was no real evidence that this occurred. No flirting or “oh wow” moments or mental or emotional connections made between the characters that would lead the reader to believe they were falling in love. We were just told they were and then later in the story we see some of the reasons why they were in love. I felt like Sprunk could have slowed down a bit and let the reader discover the characters loved each other more naturally. The only other thing I would change would be to remove some of the swearing from the book. It felt like it was only added to make it feel more dark or gritty, but in fact it just kept throwing me out of the story. I felt like Sprunk was required to add a certain number of swear words in the book by his publisher. It just felt unnatural to the story and characters. Blood and Iron is the perfect fantasy beach book. The setting goes great with water and sand. It's entertaining, and fast-paced with great characters and fascinating magical system. It is well suited for a reader who wants to have a quick, enjoyable read. Due to the level of violence and sporadic use of adult language and several implied sexual situations, I would recommend it to adults. I'd also recommend it to anyone who likes fantasies set outside of a European setting or well-developed characters. It's odd how little I've actually heard about this book, considering the few reviews I have stumbled across pretty much seem to indicate across the board that it's a good novel. I was lucky enough to get a review copy, though I haven't been able to read it yet; maybe I should try harder to make the time for it. Great review, and thanks for reminding me that this one's still on my To Read list. I would recommend giving it a try. It's a fun summer book. I really recommend reading it near a beach, if at all possible, as it adds to the setting. Well written review. Even though I dislike love triangles, this sounds like a minor part of the story so I think I will give it a try! It is very minor and doesn't carry any of the usual drama involved with a normal love triangle as some of the characters aren't even aware there is a love triangle.